The Mobile Soup Kitchen serves nutritious meals to those less fortunate 5 nights a week, 52 weeks a year. Teams of our dedicated volunteers serve hot meals, sandwiches, drinks, and desserts to members of our community outside the downtown library. Each night you can find dedicated volunteers, many of which are spiritually motivated, offering food, clothing, companionship, and pertinent information regarding area services. On frigid nights, we do not encourage anyone to wait outside for us. The Code Blue initiative transports homeless individuals to warming centers for hot meals and a place to spend the night when the temperature is below freezing. Simply call 211 for assistance. Hearts for the Homeless serves over 12,000 poor and homeless people every year, ensuring community members in need can dine with dignity. In addition to food, our mobile soup kitchen vehicle also carries a clothing pantry available to those in need of apparel. In the winter months, clients can expect to find brand new and gently used boots, blankets, socks, coats, hats, gloves, and scarves. Hearts for the Homeless relies on volunteers to help us carry out our programs. Over the years, hundreds of volunteers have come through our doors. Our Mobile Crew Members and Kitchen Assistants are dedicated community members who know that individuals and families rely on them to be out every week serving nutritious food. If you would like to volunteer as a kitchen assistant or start a Mobile Crew, please apply today. Serving food is not the only way you can help. You can help fund hearty meals and warm clothes by donating online, through your employer, or by mail. Consider taking your next shopping trip down Tonawanda Street in Buffalo at the Hearts Thrift Shop to find quality clothing, accessories, shoes, and household items at affordable prices. After expenses, all proceeds from the thrift shop will be used to support the operation of our mobile soup kitchen. In addition to the giving opportunities above, you can also directly donate items to our Mobile Soup Kitchen through Amazon. Explore our Amazon Wishlist to view critical items we are in need of. You can also donate to Hearts for the Homeless every time you make a purchase on Amazon by adding Hearts for the Homeless of Western New York Inc as your charity on Amazon Smile. Hearts for the Homeless® has been helping the poor and homeless since 1990. Hot meals are cooked, sandwiches prepared, and take-away meal bags made up beforehand and readied for our volunteer Mobile Crews to come, pack them up and deliver to our street clients at the Buffalo & Erie County Library downtown. Volunteer Mobile Crews put hot meals into Styrofoam cups then, pack into thermal bags for a hot meal delivery along with sandwiches, desserts, and drinks. 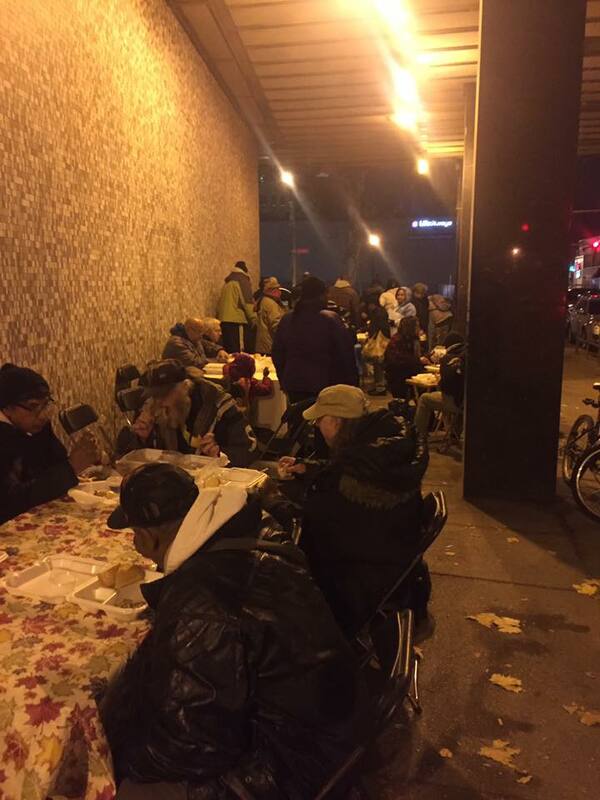 5 nights a week, 52 weeks of the year, clients line up to receive a hot meal, sandwiches, drink, and dessert. They wait in line trusting we will be there. Hearts street clients enjoy burgers, hotdogs and picnic fare straight from the grill, cooked by Hearts volunteers, right there on the street. Partnering with Hearts, members of Zion Dominion Global Outreach Church provide a complete Thanksgiving dinner buffet, and tables set with linens to welcome our street guests to sit, eat, relax and enjoy the holiday. Partnering with Hearts, the Buffalo Dream Center provides transportation to our homeless & poor clients to a memorable Christmas celebration with music, dance, gifts, and dinner.